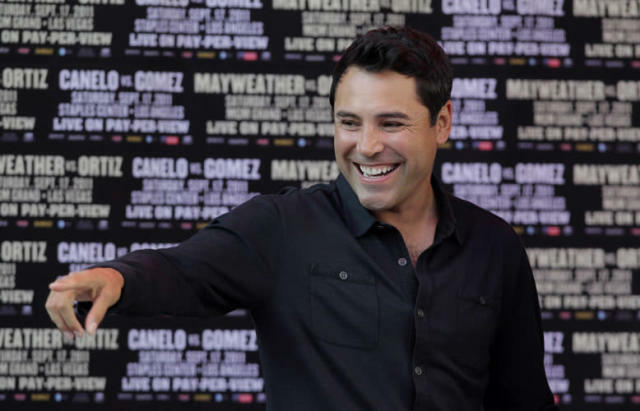 LAS VEGAS -- On the eve of potentially the biggest fight his Golden Boy Promotions has ever staged, Oscar De La Hoya announced on Tuesday that he had voluntarily checked himself into an undisclosed drug and alcohol facility. The legendary De La Hoya first went into rehab on May 21, 2011, and later admitted he was an alcoholic who had begun using cocaine. He also said he had been suicidal. Since he came out, he has spoken very publicly of his fight to stay sober, and he was a visible presence in the promotion of Saturday's mega-bout between Floyd Mayweather Jr. and Canelo Alvarez at the MGM Grand Garden. But in a stunning statement his publicists released to the media early Tuesday afternoon Eastern time, De La Hoya announced he would not attend the Mayweather-Alvarez bout because he has checked into an undisclosed treatment facility. Canelo Alvarez and I have big fights coming up this weekend. His is in the ring and mine in treatment. Thank you for your understanding. I ask for your support and privacy during this difficult time for me and my family. De La Hoya, 40, last boxed on Dec. 6, 2008, when he was stopped by Manny Pacquiao. He ended his career with a 39-6 record and 30 knockouts. His company, Golden Boy Promotions, has become one of the two largest boxing promotional companies in the world.